ARDF enthusiasts from as far away as Boston and New York gathered in southern California for the Fourth USA National ARDF Championships in mid-June. 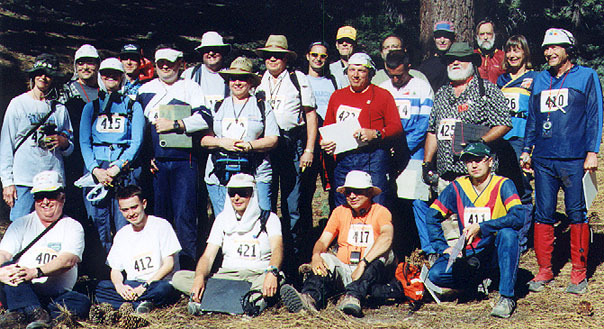 Hosting this time was the Santa Barbara Amateur Radio Club (SBARC) in close cooperation with the Los Angeles Orienteering Club (LAOC). The competitive courses were open to anyone of any age, with or without an Amateur Radio license. General Chair for the 2004 USA Championships was Marvin Johnston KE6HTS (at right), one of North America's ARDF pioneers. A member of USA's first team to the ARDF World Championships (Hungary, 1998), he has been on the team ever since, making trips to China in 2000 and Slovakia in 2002. He won medals at the USA ARDF Championships in 2002 and 2003. Marvin personally hosted a five-day ARDF training camp just prior to the championships. It began with a mix-in at the annual two-day open LAOC orienteering meet at Mt. Pinos in the Los Padres National Forest, where students polished their map-and compass skills. That was followed by 2-1/2 days of radio-orienteering at Griffith Park in Los Angeles, the largest municipal park and urban wilderness area in the USA. LAOC has two well-mapped venues in these 4100 acres. The main events got under way on Wednesday, June 16 as competitors arrived at event headquarters, the EconoLodge in Gorman, California. Gorman is an outpost on Interstate Highway 5, seventy miles northwest of downtown Los Angeles. It was chosen because it's between the venues to be used for the two championship hunts. On Thursday, everyone took a 3-mile drive deep into the Hungry Valley State Recreation Area. On weekends it's full of off-road vehicles, but mid-week was an ideal time to check out and calibrate everyone's direction finding equipment. Marvin and his helpers put out three fox transmitters on two meters and three more on 80 meters. One on each band was at the gathering spot, one on each band was 500 meters away and one per band was one kilometer out. While everyone checked their gear, Marvin cooked up a Santa Barbara style tri-tip barbecue. Opening ceremonies and a drawing for the starting order took place back in Gorman that evening. Early Friday morning, competitors piled into the bus for a ride to the full-length 2m transmitter hunt at Vasquez Rocks County Park (at left in the photos and map samples above). The early start was a good idea because the average high temperature in this desert location is 92 degrees in mid-June, and there is little available shade. The unique rock formations make for a very technical orienteering challenge -- can you find all the trails on the map? Saturday brought a shorter bus ride to the 80m event at Mt. Pinos (at right in the photos and map samples above). There was plenty of shade and cooler temperatures, but the starting point was at 8300' elevation. Although 80m signals don't "bounce" like 2m signals do, the courses were longer than on two meters and most competitors did not do as well. Closing ceremonies and medal awards took place in Gorman Saturday evening. Below are the medal winners in each age/gender category. Following the name and callsign is the state of residence, course time in minutes and seconds, and number of foxes. The USA Championships concluded just in time for final selection of ARDF Team USA 2004 members, who traveled to Brno in the Czech Republic for the 12th ARDF World Championships from September 7 through 12. USA's team positions were filled based on performances in the 2004 events in California and the 2003 USA Championships in Ohio. Click here for KØOV's album of over 40 photos from the Championships. Also at this Homing In site is a first-person account by Nancy Pistole KF6PAV, a long-time orienteer who is a newcomer to radio-O. Complete results, course setter's notes, and more first-person stories are in SBARC's official Web site of the 2004 Championships. Sam Vigil WA6NGH details his experience as a beginner at these championships in his feature article in the November 2004 issue of CQ Magazine. You can read about three innovative aspects of these championships (e-punch, training camp and medical team) in my Homing In column of CQ-VHF Magazine for Summer 2004.